About It must have been a tiring day looking after the kits. Mom looks a little grouchy. Taking this set of images was one of those magical experiences that come along once in a while. The kits were so photogenic and curious. A couple of family members have this picture hanging on their walls. The picture of the kit with the stick in his mouth took first place in a local contest a couple of years ago. I'm very pleased with this set of images. This reminds me of me with my kits sometimes! Great moment to capture. What would the caption read? "Get down from that roof!!!" This was one of those wonderful days where everything came together for me. I had the right lens on the camera and it was in the car when we spotted the mother Fox and her three kits near the road, close by a wooded area. I was able to stop a good distance away without spooking them and ended up with some really nice images. Outstanding captue with nice rich color. What I would'nt give to get one of these guys in front of my lens!!! As I already told a few other people, this was a very special day of shooting for me. Coming across the Vixen and her Kits in fairly close quarters was the kind of thing we hope for. This shot was taken along with quite a few others in about a 10 minute period that I was fortunate enough to be around for. What a day for someone like myself who loves the serendipity of Wildlife encounters. This is an awesome capture - a real beauty! Well done! Yeah, I find myself doing more and more Nature and Bird Images. I haven't lost interest in other types of images and I have a few ideas that I want to try. 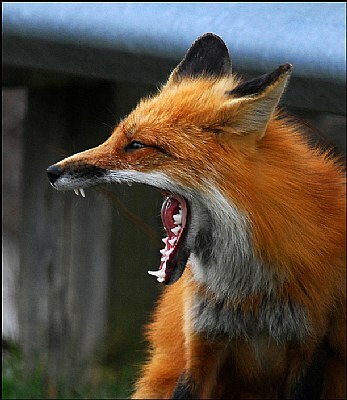 But for now, I am really enjoying the Wildlife photography. I can walk for miles on trails and maybe not see anything to shoot. But at least I'm surrounded by nature and get some excercise. Some days like this one, the reward of a few nice images is a real bonus. I find wildlife photography very challenging. At first you are happy just to get the animal or bird in the frame. Then that isn't good enough. Next you want the animal or bird up close. Then, you want the right light, then the right pose. Then they have to be doing something interesting, up close with the right light and sharp, with a glint in the eye, It never ends!!! But very rewarding when it all comes together. Beautiful colors and details as well! So very impressive catch Andre, well done ! This is a spectacular and magnificent wildlife capture Andre. Wonderful and very impressive wildlife image Andre. Excellent DOF, sharpness, colors, details.